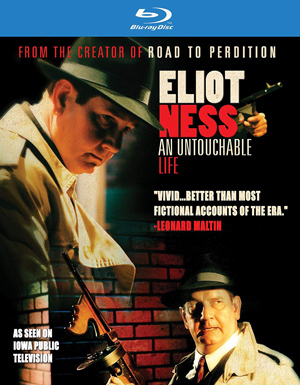 The Blu-ray of Eliot Ness: An Untouchable Life is out now. It’s available at any of the usual suspects among Internet retailers, but Amazon has it for about ten bucks off ($15.69). I’m very proud of this one, which makes a good companion to Scarface and the Untouchable: Al Capone, Eliot Ness, and the Battle for Chicago by A. Brad Schwartz and me. It is, in fact, what brought Brad and me together – he went to the play in Des Moines and saw Mike Cornelison perform the one-man show in person. Mike is gone, for several years now, and I am so grateful that we were able to have this one last, great project with the actor who was the backbone of all of my indie film projects. Mike starred in Mommy, Mommy’s Day and Real Time: Siege at Lucas Street Market. He narrated my two documentaries, Mike Hammer’s Mickey Spillane and Caveman: V.T. Hamlin and Alley Oop. He starred in two short films, one of which – “An Inconsequential Matter” – is a bonus feature on the Blu-ray. That short film was our last collaboration. Whether, at my age, in the wake of some health issues, I can ever mount another film production is a question I can’t answer (Barb can – “NO!”). My other frequent collaborator, director of photography/editor Phil Dingeldein, is still raring to go. But I admit not having Mike on the team makes it tough to imagine. For now, however, we have this fine Blu-ray, thanks to VCI Entertainment. Treat yourself to this one, and it’s a perfect stocking stuffer…. Regular readers of this update/blog know that I read little contemporary crime fiction, because of my desire not to be influenced by anyone working currently and also the busman’s holiday nature of it. Barb and I do watch a lot of British crime series, which slakes my thirst for mystery narrative – I generally find Brit TV crime more compelling and just, well, better than the American variety. Recently we watched the third season of The Forgotten and the first season of Bodyguard, and both were outstanding (I buy these from Amazon UK). I also watch a lot of vintage noir, catching up with things I have never seen that have become suddenly available (the very interesting The Man Who Cheated Himself, for example, now on Blu-ray) and revisiting things I haven’t watched in ages. The only novel I’ve read lately is Night of Camp David by Fletcher Knebel, co-author of Seven Days in May. I dug this out of my basement storehouse of old paperbacks when I learned it was now a collector’s item. The subject is a president of the United States who goes mad. Now and then I read a book that serves to do more than just lull me to sleep in a pleasant way. Such a book is The Last Days of Letterman: The Final 6 Weeks. I would say it’s a book that I enjoyed more than any in my recent memory, and yet I’m not sure exactly what compelled me to pick it up. I loved Letterman’s Late Night at NBC and am fairly sure I never missed an episode. Letterman’s wry, self-deprecating humor resonated with this Midwestern boy, and he peopled his show with guests ranging from oddball to brilliant. I could see Norm Macdonald one night and Andy Kaufmann the next. Pee Wee Herman (my pal Paul Reubens) was often a guest. Band leader Paul Shaffer, with his tongue-in-cheek show biz sensibility, was both funny and hip, an incredible musician who had hung out in Canada with SNL and SCTV stars-to-be. Dave showcased top-notch musical acts. For someone my age, this was the natural next step from Johnny Carson. So late night TV was a part of the fabric of my life. I remember dreaming about being a Carson guest some day – he was a Midwestern boy, too – and later I hoped I might get successful enough to be invited onto Letterman’s Late Show. Didn’t happen. Well, it sort of did. Stay tuned through the rest of this essay. But at some point, probably around fifteen years ago, I started missing episodes. It began when a guest was announced – usually a sports figure – that I had no interest in. At some point politics had Jon Stewart and Stephen Colbert tempting me away, now and then, and finally regularly. Things evolved into my having to know that someone I was a fan of (Elvis Costello, for example) was going to be on Letterman for me to watch. And I would tune back into Dave, and bask in the familiarity of Dave and Paul’s effortless banter, and slip back into that comfy shoe of Late Show. Funny thing is, what made Letterman and his show so comfy was how uncomfortable Dave himself seemed. He was embarrassed by his success. He always seemed like somebody just waiting to get found out and hauled off the stage. He was anything but comfortable in his skin. In a way Johnny Carson only pretended to be, Dave Letterman was us – particularly Baby Boomer boys like myself. 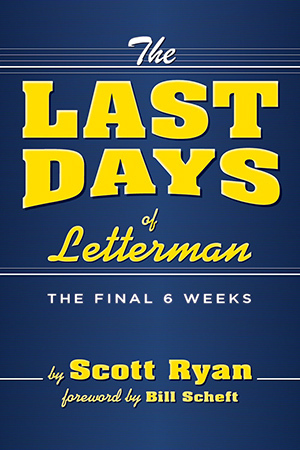 The genius of Scott Ryan’s book is the writer’s decision to focus on the final six weeks of this long-running show (and, let’s face it, Late Night and Late Show were one show). It gives Ryan a framework to discuss all the frequent guests, the famous show business figures who were indebted to Dave and (to Dave’s embarrassment) loved him. Ryan can look at the Top Ten List and various other running gags and traditions, in between describing each individual episode of those last six weeks and who was on and what happened. Because the show is coming to its conclusion, there’s a sort of suspense-novel engine at play. How will Dave handle the loss of the thing that has been his life? How will the staff around him deal with the pressures of expectation for one special episode after another? How will Letterman endure the love fest that is being flung at him and smothering him into full-throttle embarrassment? Did anyone in bigtime show business ever deal so poorly with praise? The second stroke of genius in this fine book is Ryan’s decision to tell the story as an oral history. He gets interviews not from Dave and Paul (who would never cooperate, of course, but Ryan seems not to have bothered approaching them) but to the army those two generals commanded. We hear from the officers – directors and producers – and from the grunts – stagehands and bookers. We experience the war of those last six weeks from the trenches. And it’s fascinating. And strangely moving. As I say, I had not been regularly watching Letterman. I didn’t see the final episode. I think I caught one or two of the shows during that last six weeks. But here’s the thing – as I read about these episodes that I had missed, they nonetheless played in my mind as if I had. I was so familiar, so much a part of the Letterman experience, that a few words could blossom in my imagination into the feeling that I had indeed seen them…or maybe I should say, knew them. Letterman is my age, more or less. We are Midwestern boys. I’ve had a little success and am not at all embarrassed about it, though mixed in with my egotism is some of that self-deprecation that Letterman – a huge success and extremely embarrassed about it – is so successful at conveying. Again, he also had open-heart surgery. He seemed to like a lot of the same things I did – Elvis Costello, Warren Zevon, Darlene Love – and he introduced me to the pleasures of Norm Macdonald, Chris Elliott, and Amy Sedaris. He also gave us new sides of superstars like Bruce Willis, Steve Martin, Bill Murray and Tom Hanks. This is the closest I ever got to being on Letterman, and frankly it was enough. Okay, almost enough. Dave made it clear, usually when Hanks was a guest but other times too, that he loved Road to Perdition. That got my attention. I talked to the TV and raised my hand like a kid in class. As it happens, not long after, I began to leave the fold. I decided that watching talk shows (and I don’t watch any now, though I know Colbert, Fallon, Conan and others are worthwhile) was ultimately an ephemeral waste of time. I stopped watching Colbert when, at the Second City reunion, he refused to sign an autograph (I am a petty fucker). And even Stewart faded away for me, when some of his recurring players went off to have careers. I started watching a movie on DVD and later Blu-ray at night, in the talk-show time slot, wanting to catch up with old films noir and various terrible movies for which I have an inexplicable affection. Reading The Last Days of Letterman gave the Late Show back to me. Those last six weeks, anyway. If you are or ever were a Letterman fan, you are in for a bittersweet treat. This review of Scarface and the Untouchable has a peculiar headline, but the piece itself is fine. Finally, here’s a great review of Kiss Her Goodbye, a Mike Hammer by Mickey and me. People are always asking me what I read. It’s one of the most common questions a writer gets, and I guess I understand it – apparently comes from a desire by a reader to get recommendations from someone whose work they like, and/or validation for books they like from that writer. I disappoint people when I reveal how little I read of contemporary crime fiction. I’ve stated my reasons many times, but one reason I haven’t discussed much is the busman’s holiday aspect – not that, at the end of working day immersed in crime and mystery, I want nothing more to do with my genre of choice. Rather, that the writing process has worn out the same muscles that are used for reading. So come evening, Barb and I watch plenty of crime and mystery TV and movies, although admittedly the movies tend to be older ones (like the books in the genre that I do read) and the TV tends to be British. I have a PAL friendly DVD player, and a Region B friendly Blu-ray player, letting me order discs from the UK all the time. We just watched the third season of Broadchurch, for example, and liked it very much. We also watched an excellent British series called The Forgotten, about very old, very cold cases. Also the fourth season of Endeavor and the third season of The Fall. We are looking forward (I’ve already ordered them) to seasons of Midsomer Murders, Murdoch Mysteries, the first season of Tennison, and the last season of Ripper Street. So I’m very much still interested in the genre, although much of the American brand of TV mystery leaves me lukewarm to cold. And much of my “reading” of mystery fiction these days is listening to audio books in the car. We have six-hour drives to St. Louis to see son Nate and his bride and our grandson, fairly frequently, and our day trips run to Chicago (four hours one-way) and Des Moines (three hours one-way). We listen to my own stuff – right now, Dan John Miller is doing a great job on Executive Order – and are happy to have Antiques Frame on audio to listen to next. We re-listen to Rex Stout novels and novellas for the umpteenth time, have been through all of Christie, and quite a few Simenon “Maigrets” (after watching the complete French/Belgian series starring Bruno Cremer – loved it). What I do read, and it tends to be late at night, is a certain amount of non-fiction. Currently I’m reading Brian De Palma’s Split-Screen: A Life in Film by Douglas Keesey, and enjoying it. But I want to recommend a book that you have to go to some trouble to lay hands on. No Amazon. I stumbled onto a bookstore that carries it (Mysterious Bookshop in NYC). It’s the first American edition of a French book that was available with a wonderful elaborate Blu-ray edition of Gun Crazy. Muller should need no introduction – he’s the undeniable guru of film noir, the man behind the Noir City Festival and the Noir City Foundation, with its wonderful e-mail magazine and yearly annual. Not surprisingly info is available at www.noircity.com. He’s written acclaimed fiction and non-fiction in the noir vein, and he appears regularly on TCM, every Sunday morning, your time much better spent than watching the Sunday political shows or going to church. His book on Gun Crazy is remarkable – it’s like reading a terrific Gold Medal paperback that happens to be true, digging into all of the history from my fellow Iowa author MacKinley Kantor to blacklisted screenwriter Dalton Trumbo, from the maniac King brothers to my favorite B-movie director, Joseph H. Lewis. The pictures are so great – photos, documents, script pages – that the book worked beautifully in French, which I can neither read nor speak. In English it’s sheer delight. Muller contends the auteur theory is crap, an opinion with which I don’t entirely agree, but he makes an excellent argument, using Gun Crazy – so often credited to Lewis more or less exclusively – as a case in point. My history with Gun Crazy goes back to 1967. I saw Bonnie and Clyde before the fuss, and my life was changed – the fusion of true crime and the fiction genre I loved was taken to a whole new level. I was so in the thrall of Bonnie and Clyde that I read everything I could get my hands on about the real outlaw couple, even looking at old newspapers on microfilm (setting the stage for Nathan Heller research), and I set out to see every movie derived from their story. That was no easy task in 1967. VCRs were almost a decade away, so I was left to the whim of late-night movies and a University of Iowa film series at the student union, where mostly kids came to laugh at old movies that they were so much smarter than. One by one I picked the movies off: The Bonnie Parker Story (1958), cheapjack sleaze (which is okay by me, generally); They Live by Night (1948), terrific movie directed by Nicholas Ray; You Only Live Once (1937), a Fritz Lang-directed film and another good one; and finally Gun Crazy (1950). As a kid, I’d seen a Naked City episode called “A Case Study of Two Savages” that had frightened and excited me, but had no idea Rip Torn and Tuesday Weld were doing Clyde and Bonnie. I caught up with it again a year or so ago and saw the connection, and wondered if it had inspired in any way the Arthur Penn 1967 Bonnie and Clyde. It’s surprising that the outlaw couple had already generated very good Fritz Lang and Nick Ray movies (also not surprising that a cheapjack Roger Corman-produced film existed, as part of the drive-in movie cash-in on The Untouchables TV show). But what was astonishing about Gun Crazy (in addition to a thousand other things) was that it was better than Bonnie and Clyde. That after having my life changed by Bonnie and Clyde, Gun Crazy changed it all over again, more deeply, and became a movie on my very, very short list of favorites (regular readers here may recall the others: Vertigo, Kiss Me Deadly, Phantom of the Paradise). It’s a love story in the way the best James M. Cain novels are, and that’s high praise. 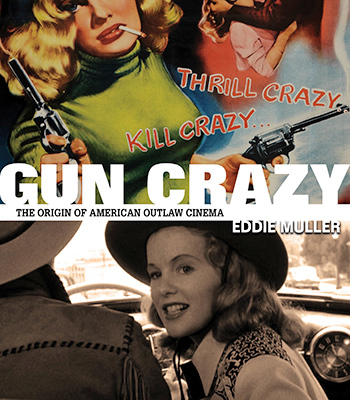 Eddie Muller’s book on Gun Crazy is so terrific, so entertaining, I had a reaction that I rarely have: Oh, good – I don’t have to write this book…somebody else has done it for me. A local paper has published a nice little article about my Grand Master “Edgar” honor, here (look past the misspelled first name, will you?). And here is Ellery Queen Mystery Magazine’s editor’s blog on the Edgar event, with a nice shout-out to me.